Here at the Greenbriar, we count Bob Taylor among our major actor faves. Yeah, we know all that stuff about how he was too pretty, too stolid, too Hollywood leading-man ordinary. Well, we think that’s the bunk! As far as we’re concerned, Bob had three careers. The first one, before the war, was Steadfast Bob, and yes, he did exemplify all the superficial vapidity we associate with cardboard leading men from that era (in fact, he even did a movie called Her Cardboard Lover). He was foursquare, decent, and properly servile (but ardent!) toward his leading ladies, but it wasn’t long before people started noticing something, well, sinister about Bob. Could it have been his widow’s peak? Or that dark pool that would open up in his eyes when tempers flared? Fans caught it first in Johnny Eager, shortly before Bob decamped for Naval service in WW2. MGM gambled with his image and let him be crooked for once, and that’s where Bob found himself. By the time he returned from his distinquished wartime hitch, Bob had, like so many other stars who’d served, become a different man. Gone was the "male beauty in distress" (as Waldo Lyedecker would put it). Now the darkness settled over Bob and he became the Great Mildly Dissipated Leading Man Of The Disillusioned Post-War Hollywood Malaise. In short, he was Bad Bob. God knows, MGM didn’t intend it that way. They’d have been happy to let him resume his pre-war role as affable prop for Greta Garbo and Norma Shearer, but for the fact that those increasingly wizened actresses were no longer on the lot, and neither was their kind of movie. Instead, Bob’s return to civilian life was celebrated with Undercurrent, a remarkable instance of perverse casting wherein he played a dashing millionaire industrialist who’s actually a deeply disturbed, murdering psychotic. That was 1946, and it’s from this point that Bob begins his scale toward Olympus. He’s a neurotic war vet in The High Wall (great scene in that where Herb Marshall pushes an old man down an elevator shaft), a compromised federal agent in The Bribe (what an atmospheric noir that is), a communist spy trying to do away with teenage wife Liz Taylor in Conspirator, and a bitter (we mean really bitter) Indian civil war vet coming back to an utterly corrupted reservation in Tony Mann’s great western noir, Devil’s Doorway. People must have figured Bob for having sold his soul to the devil after this group, and chances are, Metro noticed it too, cause all of a sudden, they started dressing him out in tunic and breastplate for a whole series of costume spectaculars. 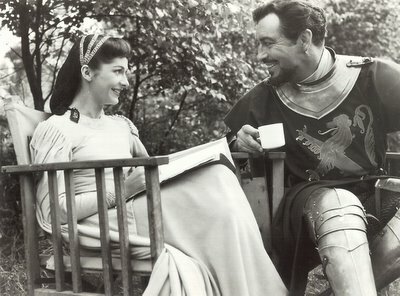 From 1951, we had Quo Vadis, Ivanhoe, Knights Of The Round Table, and The Adventures Of Quentin Durward, all in fairly rapid succession, and each a major B.O. hit, except for Quentin. Now that Bob was the Boy’s-Own Hero of a thousand adolescent admirers, would he finally abandon those dark alleys of near, if not outright, screen villainy? Thankfully, no, for he’s Bad Bob again in Rogue Cop (a kind of Metro answer to The Big Heat), never more scurrilously evil than in 1956’s The Last Hunt (his finish in that one must be seen to be believed), then knee-deep in jazz-age gangsterism in Nicholas Ray’s cultish Party Girl. If you ever watch these shows, and Bob’s terrific in all of them, be sure to catch that little snorting, dismissive half-laugh of his. It’s a nice touch, and I like the way it neatly conveys Bad Bob’s cynical worldview, as well as disposing of the need for several paragraphs of dialogue. "I’m not really laughing, you know. That’s just my way of letting you know I find this whole situation faintly amusing in a disgusting sort of way". Valiant Bob of sword and sash may have been born, but Bad Bob never died. Today we’re visiting Valiant Bob on location in Merry Old England, where 1954’s Knights Of The Round Table is making Cinemascopic history as Metro-Goldwyn-Mayer’s first feature in that exciting new process. Bob’s celebrating with a hot cup of coffee and a nice refreshing smoke. You see, this is how Bob celebrated everything, including getting up in the morning, showing up for work, and going to sleep at night. The guy was a total caffeine and nicotine fanatic. His Knights co-star, Ava Gardner, pictured with him here, said in her autobio that Bob put away anywhere from 50 to 70 cigarettes a day, "before the cocktail hour", as Ava put it. She also talked about that thermos you see in the pic. Bob lived with that thermos. It always rode in the car with him. Guy had to have his coffee close. Willing enough to share with Ava, as he does here, but there’s no doubt he’d quickly revert to Bad Bob if anyone tried to take that thermos away. Incidentally, Ava shared with Bob too, as they had themselves quite the fling that began back in ’48 when they co-starred in The Bribe. The actress with Bob in the other shot is British thesp Maureen Swanson. 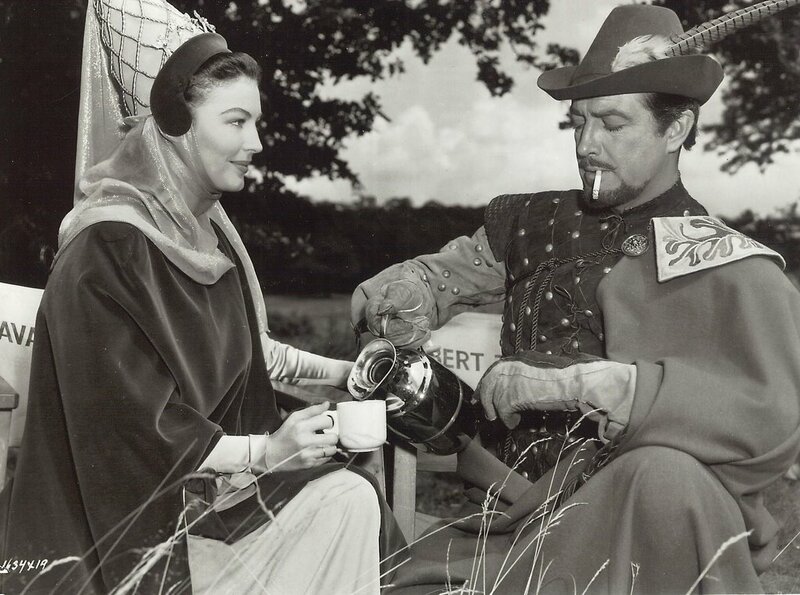 Judging from the photo, we might assume that Maureen is not a coffee-drinker, but undaunted Bob’s nursing what must have been his twentieth cup of the day. Here’s hoping his U.K. hosts provided a handy loo closeby. The actress with Robert Taylor in the second picture is Maureen Swanson, not Anne Crawford. I come back to this feature on Bob Taylor over & over. So well written, astute on aspects of not only his career -- but in ways, quietly indicating stages of his personal life. Bob Taylor wasn't the vapid, mindless sort many have tried to make him out to be over the many-years-since. I can say that since I've spent the last 15 years researching his life for a book out May 2008, "Reluctant Witness: Robert Taylor, Hollywood, & Communism." The neat thing w/your piece here is that you've indicated the various milestones of his career, & they actually corresponded to milestones of his life. There WERE reasons beyond the celluloid that spurred on the different choices he, usually intentionally, made.